Despite our children being young, travel is something our family is big on. There&apos;s something so special about experiencing new adventures as a family. The main thing we&apos;ve learned about family travel is that it should involve RELAXATION! So many times, as parents, we embark on vacations overwhelmed, overbooked, and over­stressed... only to return home feeling the same way. I&apos;m guilty of this. 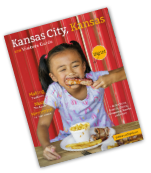 I vowed to do just the opposite on my family’s staycation to Kansas City, KS… and I succeeded! I picked up a few tricks along the way. Living up to family expectations for your family adventure is stressful. A surprise adventure, however, ditches the expectations completely! Before pulling up to the hotel, our girls had no clue where we were headed. Their eyes lit up with surprise and excitement when my husband and I finally announced our surprise family staycation! After quickly dropping of our luggage at the hotel, we grabbed a bite to eat at the nearby Applebee’s, and headed of to our first destination: a Kansas City T-Bones game! 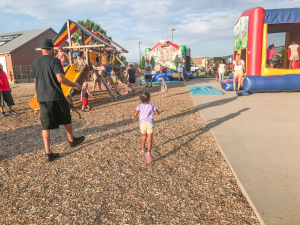 Located just a few minutes from the Holiday Inn Express and The Legends Outlets Kansas City shopping center, CommunityAmerica Ballpark is a must-visit destination. 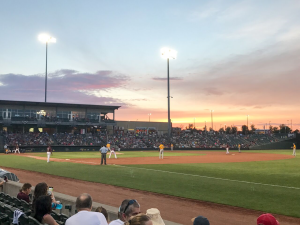 Kansas City T-Bones games are the perfect family friendly outing. We purchased our tickets online, to avoid lines when we arrived at the game. Unbeknownst to us, kids eat free every Monday at CommunityAmerica Ballpark. We were pleasantly surprised when the girls each received vouchers for a complimentary hot dog, chips, and lemonade to redeem at the concession stands! There are plenty of amazing spots around the park to hang out. You can even spread out a blanket in the general admission section, or rest at a picnic table. Our girls favorite spot was the playground, complete with inflatable bouncers! The weather was perfect for enjoying the game and we had a blast. 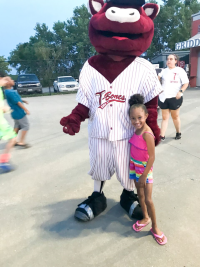 They really got a kick out of meeting Sizzle, the mascot for the Kansas City T-Bones. Since we visited over the Fourth of July holiday, it was an extra treat to watch the amazing firework display that followed the game. You can catch a show like this after all Saturday night home games too! After the game, we headed back to the hotel for a night of popcorn, movies and fun. Lodging is a huge decision when planning family travel. 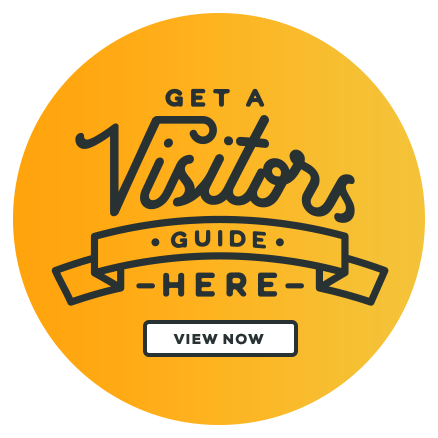 Where you choose to stay can really make or break your family’s overall experience. Holiday Inn Express Village West is a great place to begin your adventure. The complimentary breakfast area allows your family the option of grabbing a warm sit down meal in the morning, or a quick bite to eat as you head out the door. It also helps that the spacious rooms allow your family to rest in comfort, and easily maneuver around each other when getting ready. Trying to get children ready (adults too for that matter) in tight and uncomfortable spots is a great way to make everyone cranky. Luckily, that wasn’t the case and we all woke up refreshed and eager to begin the day! 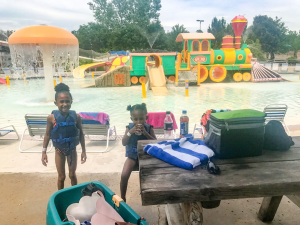 After breakfast, the following morning we swung by Walmart in the Legends Outlets Kansas City and loaded our picnic basket with goodies for our next stop: Schlitterbahn! Schlitterbahn Water Park Kansas City is a nice mixture of thrills, fun and relaxation. The fact that you can bring picnic lunches onto the park (be sure to check the website for rules before you pack) is super convenient. We sat up camp at the KinderHaven, an area filled with slides and water fun perfect for small children to splash around in. 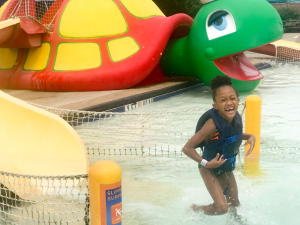 We spent a couple of hours alternating between playing in the water and snacking on finger foods, before our 8-year-old became anxious to try out some of the waterslides. 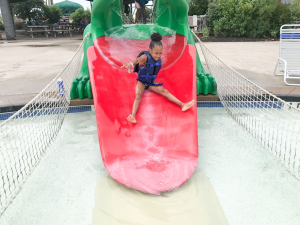 Despite this being her second time visiting the park, this is the first year she’s been tall enough (and brave enough) to tackle the slides and wave pools surrounding the park. Being a huge adventure seeker myself, I was all for it! 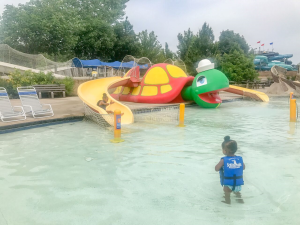 While my husband played with our youngest,she and and I hopped on a few slides nearby, then allowed the tidal wave pool to coast us to the other side of the park where we rode even more slides! We made memories that will last the both of us a lifetime! Soon we joined up with the rest of our family and migrated to the heated pool, which quickly became our favorite spot . We spent the day lazily enjoying one another in the pool and lounging beside the pool. On the way home, my husband and I shared a relaxed smile as the kids peacefully slept in the back seat. This nice and refreshing getaway in Kansas City, KS was just what we all needed. We are already looking forward to what excitement our next Kansas City, KS adventure bring. Stay tuned! Cyndi is a writer, wife, and mother of three little girls. Writing is her passion, and MrsWrightWrites.com is the small portion of the web she’s dedicated to doing just that. There she shares tidbits about parenting, career, and balancing the two. Cyndi graduated from Park University with a BS in Social Psychology with a minor in Social Work. She is a lifetime learner, and is looking forward to attending Graduate School at Friend’s University – Kansas City in the fall to pursue licensure as a Marriage and Family Therapist. When she’s not busy with family, school, or writing; Cyndi enjoys volunteering at local organizations around the Metro (and sometimes even curling up with a book, when she finds the time).